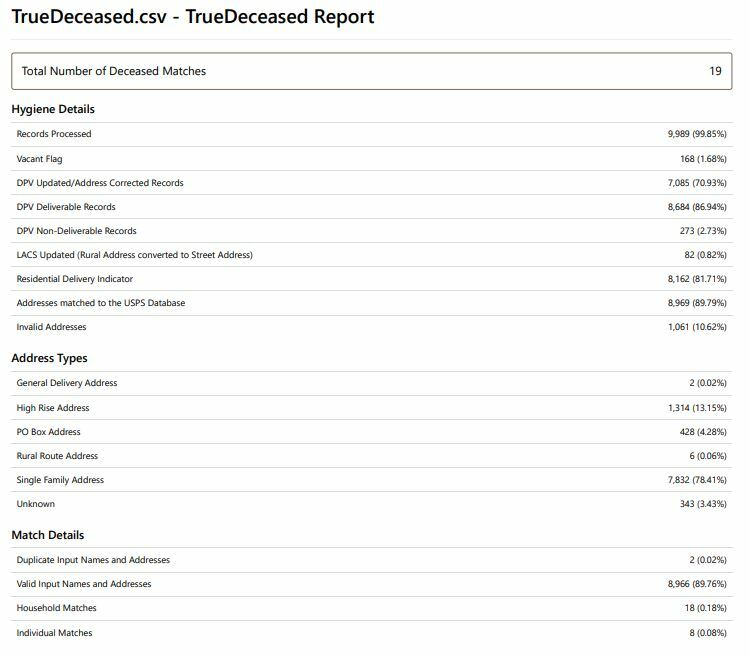 Unlike other software providers, TrueDeceased doesn't require you to purchase anything before you know the exact number of deceased append records identified on your file. Simply upload and process your file free of charge with our web application, and you'll receive a complimentary TrueDeceased report. In addition to the total number of deceased records matched, our complimentary TrueDeceased report includes details such as the total number of deceased by date, file hygiene information, address types and match information. You can Process your file for free and instantly review all of these details and more with no obligation to purchase. Upload, Paste, or Drag & Drop your data file today for our deceased append services and receive your complimentary TrueDeceased Report - no credit card required.